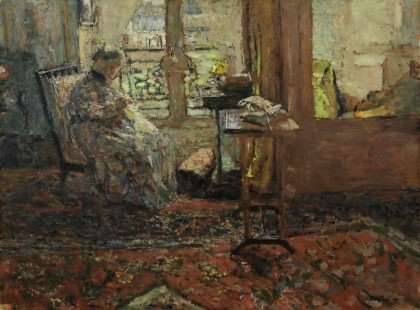 Domestic interiors play an central part in Édouard Vuillard`s oeuvre and established his reputation as an artist. Deeply attached to his mother, with whom he shared an apartment until her death, he portrayed her no less than five hundred times during his artistic career, mostly showing her occupied with common daily activities as sewing, cooking or reading. In La Couseuse Devant la Fenêtre we see the artist’s mother in profile view, sitting in an armchair in front of a large window, occupied with her needlework. To the right of her stands a pair of nesting tables as well as a large wardrobe with a mirror, reflecting the opposite side of the room. A thick floral patterned rug covers the floor. Facades of houses are visible through the window. Jacques Salomon identified the setting of this scene as the fourth floor apartment of 26 Rue de Calais, on the corner of Place Vintimille in Paris, where the artist had moved with his mother in 1907. Marie Justine Alexandrine Michaud Vuillard was a corset-maker. After her husband`s death in 1883, she had used the family home as her workshop. Her and her son’s apartment was permanently occupied with seamstresses, sewing and embroidering. Édouard would be an outsider and observer in this tightly knit world of working women. The very private character and calm mood of these domestic scenes, earned Vuillard the label intimiste. Although very modern in their execution, Vuillard’s interieurs – with their muted light and the peaceful atmosphere – owe a lot to Dutch genre painting. As one of the founding member of the Nabis, Vuillard also had a vital interest in decorative patterns. In the present composition he combines the rich textural detail of the interior space – the carpet, his mother’s dress, the reflection of the mirror – with the soft light, falling through the window. La Couseuse Devant la Fenêtre is a deeply lyrical tribute to his mother, whom Vuillard called his muse. The Paris gallery Bernheim-Jeune purchased the present painting directly from Vuillard in 1910. One of its pre-war owners, Georges Hasen, brought it to St. Petersburg, but returned to Paris with it before the Russian revolution. During WW II, the work was looted by the Nazis from the Parisian art dealer Paul Rosenberg. Nazi inventories record that the work was stolen from Rosenberg’s art deposit in Libourne, near Bordeaux, and taken to the Jeu de Paume in Paris on the Sept. 5, 1941. There the painting was labelled to go to a special ERR art repository in Nikolsburg, southern Moravia. La Couseuse Devant la Fenêtre was restituted to the Rosenberg family after WW2.